In conjunction with The Queensland Art Gallery | Gallery of Modern Art (QAGOMA), Scenic Rim Cultural Centres present free Kids on Tour activities held concurrently with QAGOMA's exhibition ‘The 9th Asia Pacific Triennial of Contemporary Art’ (APT9) and APT9 Kids. 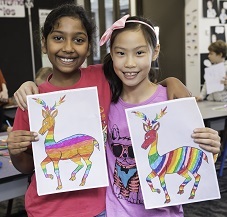 APT9 Kids on Tour invites young visitors to explore and experience diverse contemporary art styles and approaches from Australia, Asia and the Pacific. It includes EXPLORE interactive - A virtual experience featuring contemporary artworks in the APT9 exhibition. The program highlights key themes from APT9, including the preciousness of life and natural resources, the importance of community and storytelling. Kids on Tour is offered as a free program to regional Queensland and Torres Strait communities through the Gallery’s Regional Services department.